Technology is changing the way marketers reach consumers in the signage industry. In order to stay competitive with online marketers, signage companies are constantly developing their own innovations. Engineers in the industry typically develop solutions to improve visibility, flexibility, and energy efficiency in electronic signs. LED signs for example, produce bright clear images that use less energy than conventional light bulbs. Some of these signs are recyclable, wireless, and solar driven. Others are smarter than personal computers with the ability to recognize faces, gender, and age. Train stations and airports display arrival and departure times on HDTVs. Kiosks use LCD monitors and the latest touch screen technology to advertise and process orders. As LCDs get cheaper, screens get flatter, technology gets smarter, marketing techniques evolve as well. As this technology gets more accessible, digital advertising will become more pervasive. The signs of the future will display dynamic messages and interact intelligently with their audience. Signage providers who bring this technology to market should be aware that what they do strengthens the local and national economy. In order remain competitive in a technologically advancing global market, the federal and state governments provide substantial R&D tax incentives to these companies. LED technology is changing the way manufacturers make signs in several ways. It is affordable, efficient, clear and bright. According to the U.S. Department of Energy, LEDs produce more lumens per watt than incandescent bulbs and their efficiency is not affected by shape and size, unlike traditional fluorescent light bulbs or tubes. Different sign companies offer their own unique versions of LED systems for sign and electronic board= lighting. Some companies offer LED “cluster” fixtures that can generate millions of color changes randomly or by control to create various colored lighting effects. Other companies produce signs that adjust energy usage depending on light conditions so that a sign will brighten during the nighttime and dim during the day. However, using more electricity to brighten a sign at night also means higher costs at a time when traffic is minimal. Therefore, the latest signs must be smart enough to sense light conditions and adjust brightness while considering the amount of potential viewers at any given hour. This often involves complex algorithmic calculations which often means research and development expenses. OLEDs are an offshoot of conventional LED technology. Rather than an array of individual LED bulbs, OLED uses a series of films to emit light. This allows the technology to produce brighter light while using less energy than traditional LED technology. In addition, since these light-emitting films are composed of hydrocarbon chains rather than semiconductors that contain heavy metals, they are referred as organic. Lower Power Consumption – OLEDs use less energy than regular LEDs in part because of the way they project black light. Traditional LEDs produce black simply by fully closing the pixel shutter. However, the light behind the shutter is actually still shining. OLED technology, on the other hand, projects black light by shutting off the light source entirely which produces energy savings. Better Picture Quality – OLEDs produce better picture quality than regular LEDs because they incorporate their own color filters which can produce deeper blacks and a wider color gamut array. Durability and Lighter Weight - Because OLEDs produce black light differently, manufacturers can replace the heavier, shatter-prone glass substrates often used in LED displays with lighter, stronger plastic substrates. Price Point - The ability to print out OLEDs as you would a piece of paper means the cost of production is only going to continue decreasing. Although OLED technology has much potential, it is not without significant challenges. Particularly challenging is the way blue color is produced. The material used to create it degrades at a much faster rate than the materials used to create other colors. This eventually leads to a color imbalance which affects the quality of the picture. A great deal of research has been performed in pursuit of solving this problem by improving the efficiency and lifespan of blue OLED. Manufacturers who spend time and resources trying to solve these and similar challenges are eligible for federal and state R&D tax credits. Not all LED signs are mounted the same way. Some mounts involve unique designs that allow for flexibility, accessibility, and durability. Others must be made so that they can hold up the sign effectively without causing damage to the wall or supporting structure behind it. One vendor has created a sign that uses the sides of a letter to hold a prong that plugs into an electronic wall outlet. The lightweight design of the sign actually allows it to be supported by the electrical outlet -- similar to a nightlight supports itself by its plug. Other mounts allow the sign to be fastened to a wall with a suction cup or a certain glue element. However, those methods must take into account the type of material that a sign will be fastened to along with the weight and size of the sign. This requires varying glue or suction strength. Many times engineers test an assortment of products before arriving at a suitable one. This usually involves cash outlays which may be considered as qualified research expenses (QRE’s) towards the R&D credit. The way an electronic sign is powered is often a real concern for signage users. Many of these end users erect multiple signs in small areas. For that reason, typical wall connectors are not always practical. Other users are concerned with safety and environmental hazards. One solution to this is a solar powered sign. This type of power source is often very feasible because many signs are outside. 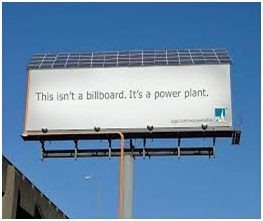 Electronic billboards for instance, are installed where there is no electricity, or the nearest electric supply is some distance away. Rather than spending thousands on trenching and electrician costs, solar powered signs provide an easy to install solution. Experienced sign manufacturers know how to create signs at competitive rates. That is because they invest their own time and money brainstorming and developing innovative cost efficient solutions. There is always a way to develop a workable sign using a slightly different material, packaging it in a slightly different container, or subtracting a certain component part. However, sometimes there is uncertainty as to whether the product will still perform as intended. When companies are willing to take these risks, there is often a process of experimentation involved. Achieving a low cost solution requires an investment in supplies, employee time, and sometimes outside contractor costs. These expenses drive the R&D tax credit. Smart signs are revolutionizing the way marketers reach their audiences. Not only do the latest signs grab more attention from users who look at them but they actually look back as well. What’s more, they are smart enough to realize which of their messages generate a positive reaction from the consumer. They pick up on facial clues like smiles, eye contact, or a pointing finger. The sign can then generate a rating for that message and store it into a database. This way the ineffective messages can be weeded out from the effective ones. That technology helps brick and mortar establishments to better compete with their online competitors. Some signs can recognize whether the viewer is male or female and present offers for products more likely to appeal to them. Other signs can pick up data from nearby smart phones in order to learn the customers interests. Once the sign has customer information, it can send an appropriate advertisement or send the customer an electronic coupon. There is a large, growing market for digital signage producers. The technology is dynamic, effective, and easy to use. It adds customer experience, optimizes store processes and provides another entry point to the POS. Unlike traditional signs, users can change the content on the ad very easily from their personal computers in order to display not only letters and words but pictures and graphics designs as well. It can be not only informational but interactive as well. The technology is particularly effective in places where people tend to congregate and have long dwell times such as airports. These settings provide great opportunities for digital advertising because consumers are more likely to respond enthusiastically when they have nowhere to go and nothing better to do. Digital signage is the advertising of the future. The next generation of this technology will likely involve even more consumer interactions. Imagine holographs that pop up out of thin air and respond to inquiries by consumers, helping them to explore merchandise while recording data and feedback, reading customer reviews and viewing past customer purchase history. Starwood Hotels & Resorts Worldwide recently opened a new design lab with many resources earmarked for digital signage development. The new 46,000 square foot facility which is located in Manhattan’s Garment District is referred to as “Starlab”. It features mirrors which double as digital screens and a chandelier that includes a news ticker. Mike Tiedy, Senior VP of global brand design and innovation at the company states, "Starlab serves as our rallying cry for innovation, a proving ground for new ideas, and a way to encourage collaboration among our design, digital and brand teams." The collaboration he is talking about is the latest emerging philosophy in all innovative industries. Innovative businesses collaborate not only by assembling people from cross-sectors of their business operations but also by working with other innovative businesses, academic research labs, and trade organizations. InfoComm International is the trade association representing the professional audiovisual and information communications industries worldwide. They serve their members and the industry through education, providing resources, and creating social gathering events. They recently created a popular webinar, “Digital Signage in Food Services”, which describes how digital signage is being applied in the food services industry. Fast casual restaurants, food courts, concessions, cafeterias, cafes, coffee shops, take-out restaurants and bars are one of the highest growth markets for digital signage. The webinar is intended for those operating food service establishments and provides insight to the economics of digital signage investment. Technological innovation is changing the way marketers reach consumers in the signage industry. Engineers typically develop solutions to improve visibility, flexibility, and energy efficiency in electronic signs. Companies involved in architectural signage innovation should be aware of the federal and state R&D tax credits available to help stimulate the efforts.